You may have heard of kataïfi or kadaïfi, it is basically phyllo that is thinly shredded in thread like strands. It looks like shredded wheat. 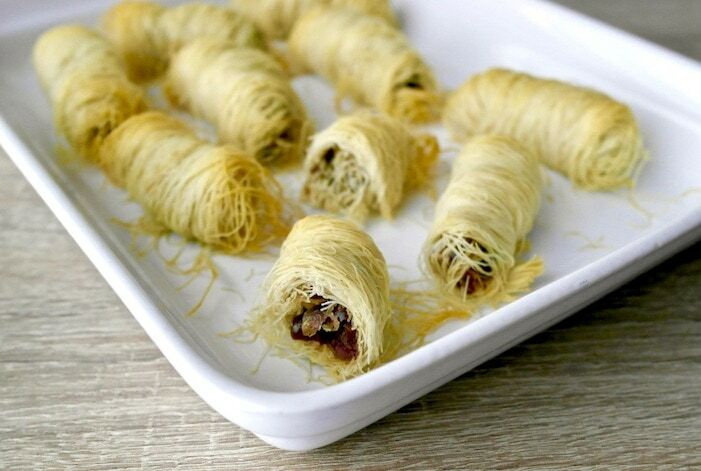 The most common way it is used in Greek cuisine is in the traditional sweet also called kataifi, which are rolls made with this phyllo filled with walnuts and drizzled with honey syrup. You also see kataifi phyllo wrapped around shrimp or vegetables. 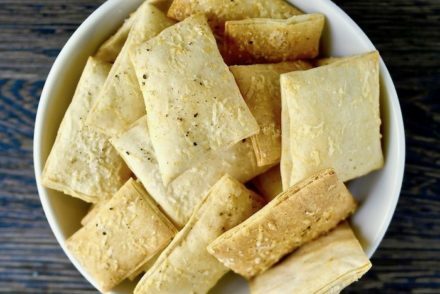 When kataifi is baked or fried it becomes nice and crunchy. 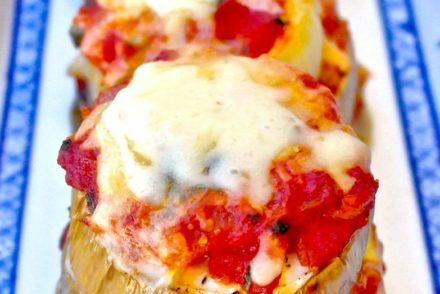 This recipe is slightly different, it combines both sweet and salty flavors. Caramelized onion along with kalamata olives are wrapped with this pretty phyllo strands and then drizzled with honey. This was so good and it is perfect as an appetizer or an hors d’oevre. Oh, and did I mention that it is vegan? 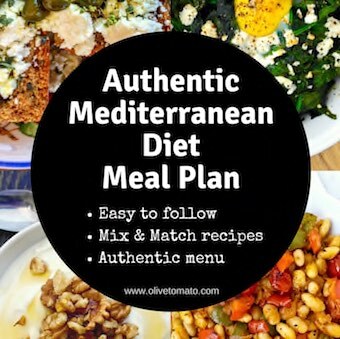 I was inspired by a similar recipe I saw in a magazine of a local super market here in Greece during lent that included various vegan recipes and this was one of them. I had not worked with kataifi phyllo in the past, and at first I thought that this would be hard, but phyllo in all its forms is quite forgiving. First of all, make sure you defrost in the refrigerator not out in room temperature-you do not want soggy kataifi. When you open the package, you need to unroll it and separate the strands in as many pieces you will make and you may need to cut them in the length that you need. 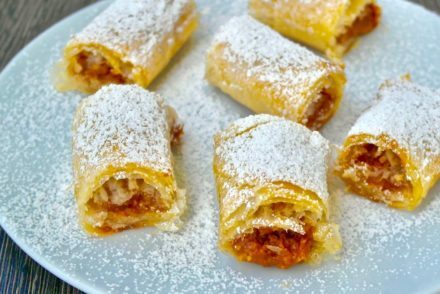 You want to make sure that it does not get dry, so have your filling ready, work somewhat quickly and keep the phyllo covered with a damp towel while you are preparing the rolls. When rolling, it may seem like it will fall apart, but roll it as tightly as you can, tucking in the sides and you will be fine. 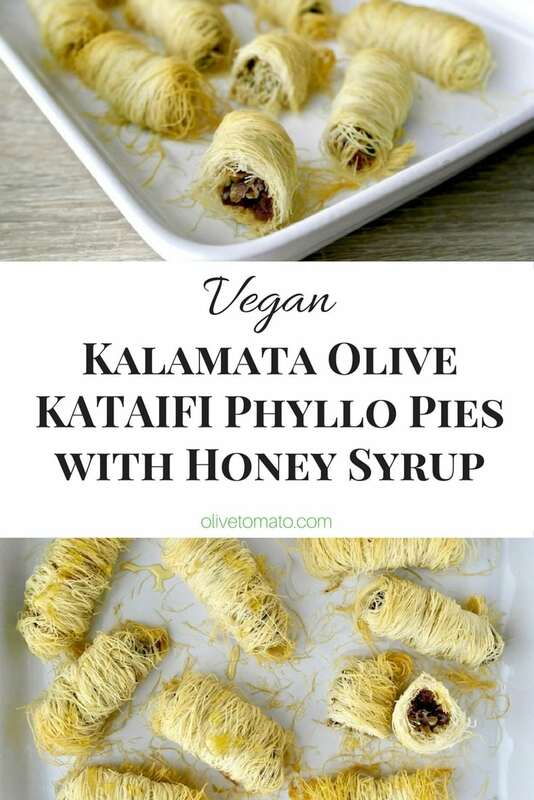 There are several companies that sell this kataifi phyllo, some that come to mind is the Filo Factory and Athens Foods. Heat the olive oil on medium heat in a pan. Add onions and cook stirring every 5-10 minutes until caramelized. This may take 20-30 minutes. Watch that the onions do not burn. Preheat oven at 350 degrees Fahrenheit (180 C). Once the onions are cooked, add the olives, oregano, lemon zest and a bit of pepper and mix. Set aside to cool. Take out the phyllo, use only 2/3 of a pound (wrap the rest and put it in the refrigerator) and separate in 16 sections approximately 6 inches long and 2 inches wide. Cover the pieces with a damp towel. 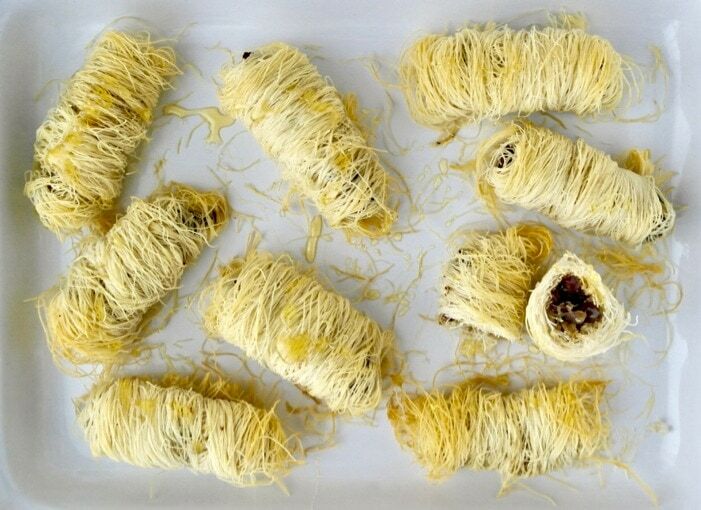 Brush each section with olive oil and place about a tablespoon of the filling on one side of the phyllo strip, roll as tightly as you can and tuck in any strays. Place on a pan. Repeat this for all your rolls. Brush all of them with a bit of olive oil and sprinkle with water. * It is preferable that the pies fit snugly in your pan rather than far apart. Bake for about 20 minutes until phyllo is golden. Let them cool and then start preparing syrup. In a small pot mix the honey and the ouzo and simmer for about 3 minutes. Pour the syrup over each pie and let it sit for at least an hour so that the pies can absorb the syrup. I shall definitely try these! Thank you!